Confederate soldier's letter, 2 pages 4to., Fayetteville, North Carolina, May 28th, 1864. George B. Broadfoot (Co. B, 13th North Carolina Battn Light Artillery, previously in Co. A, 5th NC Cavalry) writes to his brother Charles W. Broadfoot in the 1st NC Reserves. Charles previously served in the 1st NC Infantry, the 43rd NC Infantry, and as Aide-De-Camp to General Theo. Holmes. "...You will doubtless be surprised to know that I am in Fayet but so it is and rather contrary to my wishes. After I received my exchange papers I went to Capt. McKeller and requested to go through the present campaign with my old regiment, but no, I must leave knowing they were soon to be engaged with the enemy. McKeller told me he was sorry to see me leave as did Maj. McNeill & Lieut. Nott so I came on to Richmond heard the Yankees were threatening the city and immediately volunteered my poor services and joined an infantry company, or rather a detachment of the 2nd NC Infantry. We were in line of battle about two days and nights but were not actually engaged. I never felt more like fighting in my life. The enemy attacked the right of our line but I was on the left of center. I was in Richmond when THs (General Theophilus Holmes' son) passed through but did not see him tho. I looked all over town for him. A. M. Young who was at Chapel H with you and is sneaked out of the army, being agent of the NC Depot in Richmond, he told me to give his respects to you. I remained in Richmond about two weeks or rather on the fortifications. I just heard Ma read your letter saying you had beeen elected Major. I am glad". Very Fine. 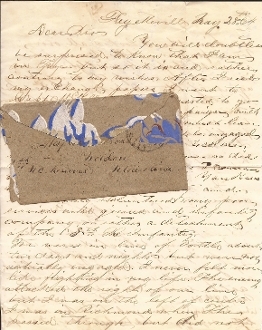 The letter is accompanied by the original made of wallpaper cover, postmarked Fayettville, NC. Stamp cut off.